A study published this week in the Royal Society journal Biology Letters finds that bees are able to learn which flowers to collect nectar and pollen from based on the colour of the blooms. Bees gather nectar as a carbohydrate source and harvest pollen for protein- both essential parts of a bee's diet. 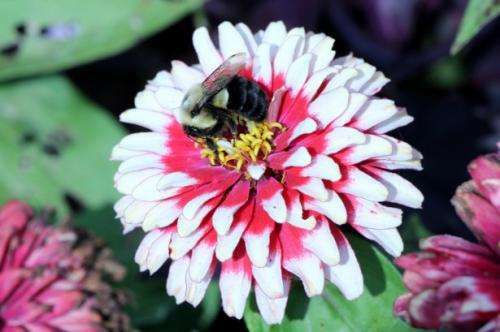 A lab study lead by Felicity Muth at University of Nevada shows that bees can learn to associate pollen and nectar each with a different colour flower to help them forage for the different nutrients at the same time. Researchers trained groups of bees in the lab to associate yellow flowers and blue flowers with either a cherry pollen reward or with sugar water- a stand in for flower nectar. After the bees had learnt which colour flowers contained which food the team tested the bees on a group of 16 artificial flowers including the original yellow and blue as well as orange and purple blooms that the bees hadn't encountered before. The team filmed the behaviour of bees to see which flowers they tried to collect pollen from and where they attempted to gather nectar-harvesting techniques which require different bee body movements. In the test 20 bees collected both pollen and nectar. The results showed that the bees were more likely to search for pollen and nectar on the coloured flowers they had learnt to associate with the treats and less likely to check out the flowers which they had previously been trained to associate with the other reward. The bees could also generalise what they had learnt. Bees who knew yellow flowers meant nectar also tried to get nectar from orange flowers but not from green; and bees who knew pollen came from blue flowers tried to harvest it from the green flowers as well. Scientists have long studied learning and memory in bees, but so far have only focused on testing their learning and memory when only one reward is involved. This study shows that bees can learn to associate colours with multiple rewards simultaneously. It's a skill which would be useful for general foragers like bumblebees that have a diverse diet often foraged from different places.